There’s nothing quite like the resilience of Houston. Neighbors helping neighbors. Strangers helping Strangers. Everyone coming together as one community. One year after Hurricane Harvey, Houston’s own Sarah Fisher reflects on the amazing people who lent a helping hand in a time of need through a larger-than-life sized artwork. 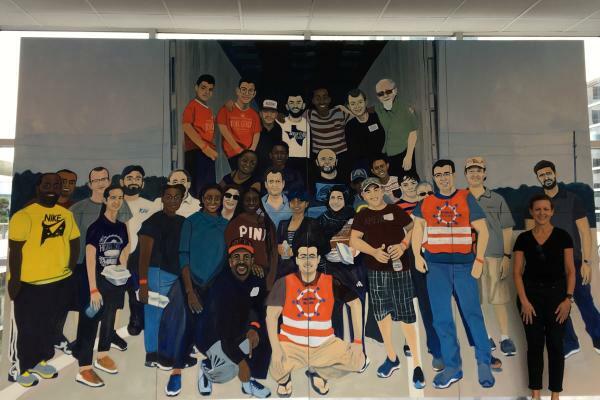 “To commemorate the magnanimity of Houstonians’ resilience and altruistic response to Hurricane Harvey, I painted this monumental, human-scale, eight-panel, oil-on-canvas portrait of my fellow volunteers,” Fisher shared. “This group worked together, seamlessly accepting donations outside NRG Center the day after Harris County Judge Ed Emmett and Baker Ripley CEO Angela Blanchard opened a shelter there for people impacted by the storm. They exemplify the whole-hearted spirit that emerged all over the city and carried Houston through those dark, anxious days last September. In addition to its skywalk location in the George R. Brown Convention Center (GRB), Fisher’s painting is highlighted in Houstonia and the September issue of Texas Monthly. Prior to coming to the GRB, the painting displayed at George Bush Intercontinental Airport and NRG Center. Fisher has also shared postings of her journey with the painting with her Instagram followers. 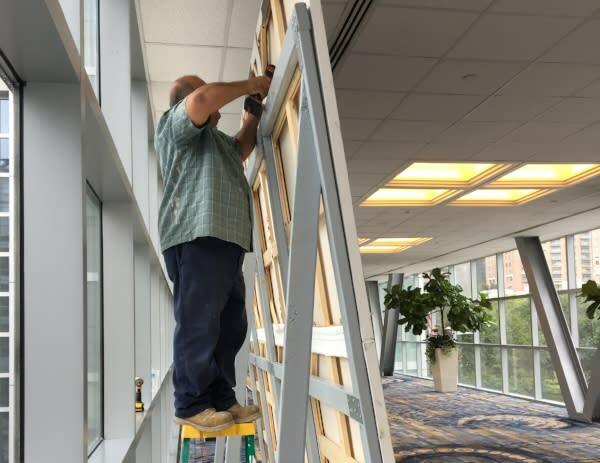 Sarah Fisher’s large-scale, four-panel painting is currently on display through September 29 in the George R. Brown Convention Center on the Level 2 Skybridge, connected to Hilton Americas-Houston.